Educationists have urged the State Government to ban plastic within all school limits of the state and stop the use of plastic material in and around every school. The Department of State Educational Research and Training (DSERT) has asked all schools in the State to take a pledge and get families and parents of the students to sign up to stop the use of plastic completely. The principal of a Poornapramathi School in Girinagar, Bengaluru, Shashirekha had recently written a letter to the principal secretary of the Department of Education urging a stop to the use of plastic materials in the school and also in their surroundings. The department officials sent this request to DSERT to make a state-wide plan. The DSERT has asked the schools with the help of district and block officials throughout the State to ensure that, school children, their parents, families and neighbouring village members take a pledge on this. Educationist Nagesh Hegde and Shashirekha informed the department that this activity will be one of its kind in India if implemented in all the schools of the State. 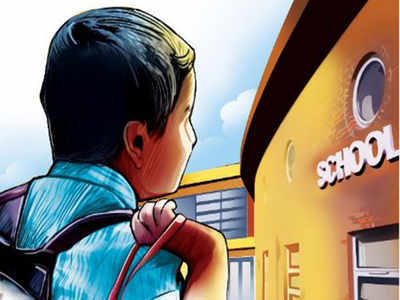 In a bid to improve the quality of education, the Karnataka government is considering a proposal to make compulsory for state government employees to send their children to government schools rather than private schools. “By making government employees enroll their wards in government schools, we hope to make them stakeholders in the betterment of these schools,” Mahesh added. In order to implement the proposal the Karnataka government is seeking a legal opinion. “We have asked for legal opinion to ensure that we do not go against some judgments of the Supreme Court, where it held that state governments cannot dictate the choice of the school of the children. We are looking at ways to overcome this,” Mahesh said. In the month of June, it was proposed in Karnataka to pilot English-medium classes in 1,000 government schools. According to a survey during 2011-15, the total enrolment in government schools fell by 11.2 million, whereas in private, it rose by 16 million. Nearly 15 primary and secondary schools have been given closure notices for operating without permission in parts of Bengaluru. According to officials, the schools had been set up on an ad hoc basis without getting approvals from the department. “Each section has a maximum of seven children already admitted, and some barely have two. It will not be a problem re-admitting these children to other schools,” said an Education Department official. The schools are located in Austin Town, Jayanagar, Mangammapalya, HSR Layout, Bandepalya, and Hulimavu, among others. Schools merely focus on the academic aspect of a child’s life. Though a student spends the larger share of his/her day in schools, social and emotional development of the child receives little attention. This is the premise of the three-day ‘Schools that Care 2017’ conference being organised by The Teacher Foundation (TTF) from July 13 to 15. “When children come out of school and move into college or a workplace, they should be capable of handling internal and external stress. Adults influence the development of social and emotional competencies in children and since they spend so much time in school, the environment there should be gentle and caring,” said Maya Menon, the director of the foundation. The conference will also mark 15 years of the existence of the foundation, which trains and supports teachers to impart education effectively. The first day of the conference will be on the theme ‘Caring to Learn, Learning to Care’ and will explore why ideas like empathy and tolerance are important in schools. The keynote address will be delivered by Roger Weissberg, professor of psychology at the University of Illinois. There will be a panel discussion on the day’s theme with the participation of Dr Shekhar P Seshadri, child psychiatrist and professor at Nimhans, writer Aakar Patel and film maker Shabnam Virmani, among others. TTF will release key findings from its study on ‘Standards for Social and Emotional Learning for Indian Schools’. Talks and discussions on the second day will deal with how schools can shift focus to emotional development. The keynote address will be delivered by educationist Jenny Mosley who created a ‘Circle Time’ model for educational training. The third day will have a discussion with a panel of students who will talk about their perspectives on school. Principals, teachers and educationists from across the country will be taking part in the conference. Bengaluru: As the new academic year enters its second week, state syllabus schools have still not received all the revised textbooks. The textbooks for Classes I to VIII had been revised by a committee headed by Bargur Ramachandrappa. There were 511 titles to be printed but a delay in issuing work orders and shortage of paper to print the six crore books had resulted in several delays. M A Khan, secretary of the Bangalore South District High School Headmasters' Association, said that only about 25% of all books from Class I to X had reached his school. "Most of the textbooks for the core subjects such as science, mathematics and social science have arrived. But we haven't received a majority of the language textbooks yet. For now, we are engaging the students by teaching them general concepts such as letter-writing based on the old textbook," he said. Khan added that since teachers did not get the books before the academic year, they are taking time to familiarise themselves with the content and plan for lessons. The principal of a government school in South Bengaluru said that they had received about 70% of the books. In Bengaluru, according to information from block-level officers, between 50% and 60% of distribution is completed. "In my taluk, we require 218 titles. So far, 64% of the books have already been supplied and new loads are getting delivered everyday. We will complete the distribution of books by June 10," one official in the city said.